A really splendid quality Carlton Ware milk or water jug . 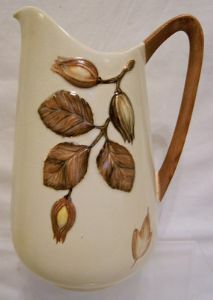 It is a vintage Australian registered design handpainted Hazel Nut Milk/Water Jug dating from the 1950s period. It has a beautifully embossed design of brown hazel nuts all set on a cream ground. It is appropriately backstamped as an Australian registered design and has the impressed shape number 2311. It is 8 inches (20 cms) high. The Jug is in perfect condition.